Published: Nov. 13, 2016 at 10:09 p.m. Updated: Nov. 14, 2016 at 05:48 p.m.
PITTSBURGH -- Tony Romo was dressing quickly and alone at his locker, putting on his blue suit, interrupted only by the occasional polite congratulation that came his way. 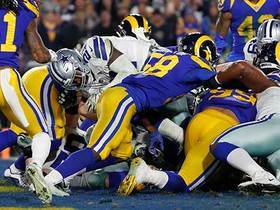 After a few moments, Jerry Jones bounded in, fresh from the box where he had watched the Dallas Cowboys' latest epic, a 35-30 thriller in which the two rookie superstars had led the way to two touchdowns in the final two minutes. 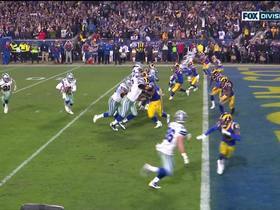 Jones paused before Romo and pulled him close for a moment, Jones' wide grin met by Romo's tighter one, an owner and his beloved player knowing exactly what would come next. Jones spoke to a few more players and then he stopped, maybe 10 feet from Romo, and began to explain how Dak Prescott was taking any decision about who starts at quarterback out of everybody's hands. In the first half at Pittsburgh, when Prescott was serviceable if unspectacular, you could imagine a scenario in which the Cowboys might lose to the Steelers and then maybe next Sunday to the Ravens, and the switch to Romo would be made in time for a triumphant return on Thanksgiving. That is almost inconceivable now, not with the Cowboys at 8-1, not with Prescott completing 22 of 32 passes for 319 yards -- his first 300-yard game -- not with the Cowboys opening a commanding lead in the NFC East. Not with Jones, Romo's most ardent supporter, all but conceding that there was really no decision to make. Romo, he said, would dress as the backup next week -- and no, Jones insisted, that would not be awkward. Not for Romo. Not for Prescott. Not for the rest of the Cowboys who have rallied around this rookie phenomenon. "The longer he plays like this, the more we have a chance to have another win," Jones said. "Everyone wants to do only one thing: win. There is nobody that would introduce any other issue or any other consideration, other than to do whatever it takes to win the game. To come out of here with a win just obliterates any thoughts about any issues you might have about who is on the field." 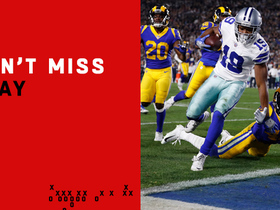 Jones pointed to one play, a 10-yard pass to Cole Beasley on second-and-10 from the Cowboys' 25-yard line with just 37 seconds remaining and the Cowboys trailing by one. The teams already had traded touchdown drives in the fourth quarter: the Steelers, then the Cowboys, then the Steelers again, on a Dan Marino-esque fake-spike touchdown pass to Antonio Brown that came too quickly. Jones would say later he has never, in all his years, seen two rookies have the impact that Prescott and Ezekiel Elliott have had on the Cowboys at the same time -- the way they feed off each other, the way the Cowboys feed off them. Now, with the Steelers clinging to that slim lead, it was Prescott and Elliott leading the way, the QB reminding himself and the team that the Cowboys practice drills with 40 seconds remaining every Thursday. Prescott completed three straight passes, and then Elliott authored a 32-yard scoring scamper up the middle, with that mammoth offensive line opening a hole as wide as one of the three rivers. "He's evolving and actually performing at a level that is very inordinate -- eight wins is inordinate for our team," Jones said of Prescott's preternatural poise. "Everybody recognizes that. On the other hand, we saw a veteran player out there come back in (Ben) Roethlisberger and show what a veteran player can do and make a difference with his ability to play like a veteran. We're very fortunate. We have the best of both worlds." It is an extraordinary luxury for a team that has to not think big picture -- not think too much about who is the quarterback of the future and how to manage the aging veteran as he likely prepares to depart -- but much more immediately. With no superpower in the NFC, with many of the other pretenders in Atlanta, Green Bay, Minnesota and Carolina falling on Sunday, the Cowboys must now wonder, Why not us? Why can't Dallas be the Super Bowl team? The 'Boys have to manage their quarterbacks with that in mind. 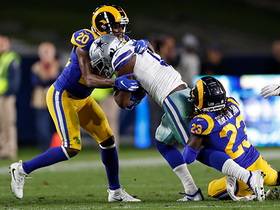 Until Sunday, it was still possible to imagine that a switch could be in the offing with just a few losses, with a few rookie mistakes -- the Cowboys, after all, had faced the weakest strength of schedule in opponents. Prescott had a leash, but it was presumably only as long as the lead in the NFC East. Not after Sunday. Prescott had passed all his earlier tests, but this one was different -- against a high-powered offense that kept scoring. The look that crossed Romo's face when Prescott uncorked a beautiful 50-yard pass that led Dez Bryant perfectly into the end zone -- a small, wistful smile, just as the camera framed Romo up -- suggests that Romo knows that the moment that's passing him by is being seized by Prescott. Romo and Jones spent time talking Saturday when Romo went to a high school football game that one of Jones' grandsons was playing in. Jones has never made a secret of his personal affection for Romo, of how he would feel it is a failure if the Cowboys do not win a Super Bowl with him. What neither of them could have imagined is that the Cowboys might win a Super Bowl with Romo -- on the bench. "He really has got a better picture about having any angst here about the quarterback position; he probably has got the best framework, the best mindset of any of us," Jones said. Then he added: "He's genuinely excited. There's nobody happier for our success because it's his success." A few feet away, Romo slipped out the door, the Cowboys' success his success, the Cowboys' future not his own.